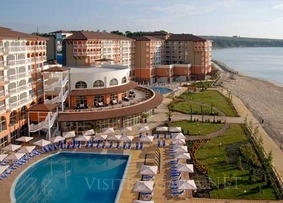 Location: Sol Luna Bay Resort Hotel is located 45 minutes away from Varna airport and only 10 minutes away from the nearby towns Byala and Obzor. The resort is located 50 minutes away northern from Burgas airport. Overlooking the Black sea and boasting magnificent views, Sol Luna Bay Resort is located directly on the fine, sandy beach, amidst unspoiled natural beauty of both mountain and sea. This luxurious resort offers high quality accommodation for leisure guests in a unique vacation destination. The secluded holiday complex is very attractive for strolls along the picturesque coast and for water sports practicing. Accommodation: Sol Luna Bay Resort Hotel offers 374 comfortable double rooms and 84 family rooms (2 of them are wheelchair accessible) with beautiful view towards the sea or the park. The rooms feature Bathroom with make-up mirror and hairdryer, Satellite TV, Direct dial telephones in the room, Mini-bar, Safe deposit box, Fresh-air windows and sofa bed. The hotel is fully wheelchair accessible and features 4 special access rooms with wheel-in showers, shower seats, grab rails, toilet raisers and emergency call buttons. Conference Facilities: Sol Luna Bay Resort Hotel offers a modern conference block with one large conference hall for up to 240 attendants and several smaller meeting rooms, all with Hi-tech conference equipment. Entertainment: Sol Luna Bay Resort features SPA centre, indoor and outdoor swimming pools, Jacuzzi, fitness, massages, sauna, spa procedures. Aqua park with 6 water slides for the guests of Sol Luna Bay hotel (free for guests). At guests disposal is game room, as well as billiards, table tennis, darts. - Lobby bar, Entertainment bar, Pool bar. - Italian restaurant “Luna” with traditional Italian sandwiches and dishes, drinks and beautiful sea view. - Paellador “Levante“ - Mediterranean cuisine, tea, coffee and other drinks.